Archology » Where should you spend your money from your limited budget? Where should you spend your money from your limited budget? piles are set back in 6″ to 12″ from the edge of the house, and the joists are cantilevered over. 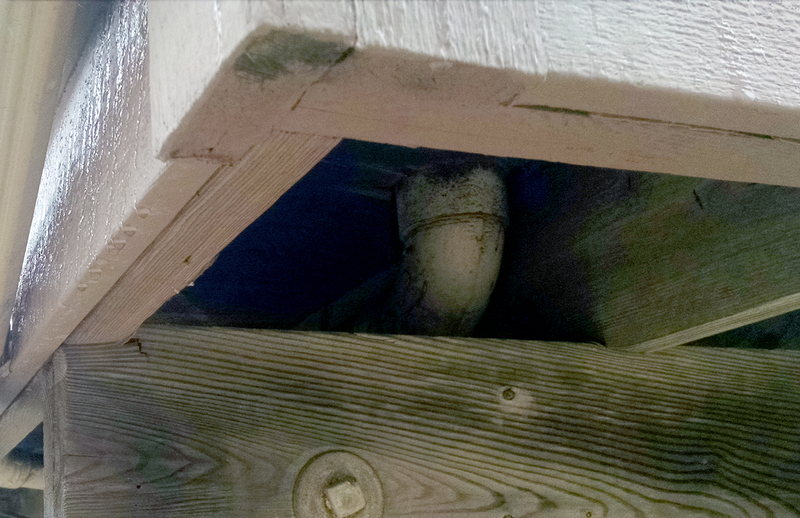 Over twenty years, the joists had crushed and sagged, as you can see, which is a bigger problem than it seems. First, the joists will eventually fail causing the entire how to collapse, potentially suddenly and tragically. Second, the entire house has now been affected. Every floor now sags, noticeably, an inch or two, which means that all of the expensive finishes on the floors and walls are warped. The act of fixing this will make that situation even worse, most of the nice stuff on the walls will probably be cracked or damaged as they push the joists back up to level meaning that for the want of a couple inches in the joists, they will probably have to remodel the entire house. Everyone has a budget. Even Bill Gates decided his house had too much stone and asked his architect to tone it down some (a story I heard from his architect back in school.) The trick with any job, and where a professional can be incredibly helpful, is to know how to allocate the money. The difference between a well built house and a tract home is often the structure beneath. Remember, if you’re just trying to build as many houses as possible and sell them for as much as possible, you would naturally cut back on the structure first. If you build the bare minimum you can legally build, most home buyers will never realize it as it’s all hidden and most problems won’t appear for 2-5 years. Instead, they spend their money on the upgrades, luxurious kitchens, trim packages, exotic flooring, etc. Finish details that stand out proudly, but, like in the example I shared, will all be damaged and have to be replaced sooner than normal. The structure is like your skeleton, you never see it, but when it goes wrong, everything else gets affected and it’s time consuming and difficult to fix properly. So, how should you apportion your money? That depends on your goals and a professional can help with this more than a simple blog post. I like to look at it this way, you should spend more money on the items that are supposed to last longer and are more difficult to upgrade or replace. Saving money on your foundation is outright folly as they aren’t that expensive to begin with, and if they fail, they’re extraordinarily expensive to upgrade. The next level would be your structural walls and floors for similar reasons. Windows and doors are something you can save on, but keep in mind how long you’ll be in the house, the longer you plan to stay, the more spending money on higher quality pays off. There are loads of options that you could pick from when it comes to your doors. If you want a door going into the garden for example then a bi-folding door might be the ideal solution, if you are looking to make your house feel bigger and more welcoming. There would b a very nice fluidity between the inside of your house and the outside. Siding and exterior trim are supposed to last between 15-100 years depending on the material and can be a good place to economize as it is easily upgraded in the future. The same for kitchens and flooring as they generally have a life expectancy of 15-20 years and are simple to change out. Interior trim packages are the top spot to save money, to me. Generally, they’re pretty easy to DIY while you’re living in the house, and while have a skilled professional will help the job go quicker and with less waste (can’t tell you how many feet of crown molding I’ve thrown out over the years for an inability to make a decent coping cut) it’s definitely something that can come later. I find that you’re always better off cutting on the items that you will redo or upgrade after a little while. Of course, if you’re looking to make a quick buck, some of this logic flips as you won’t be there for the problems or expensive fixes later, and you want people to feel they’re getting more than they really are. But you do have to be careful with that thinking. A house in my own neighborhood was purchased by a flipper before the market turned, he used cheap materials to upgrade everything, and ended up stuck with it when the market tanked. Now, several years later, the materials that looked good when he bought them have degraded horribly and have dragged down the value of the house as anyone can see there will need to be another remodel in the near future. In construction, you generally get what you pay for, deciding where you need that expense and where you can cut is where having some experience by your side can immensely help and save you in the long run. So if you want that quiet air conditioning unit, then you should pay for it at the very start. It would save you a lot of time. Just as a point of comparison, the house in the opening example is probably looking at 20-30 thousand just to fix the bottom floor structure, and then probably another 10-20 to fix the damage that repair will cost. I wouldn’t be surprised if the house itself cost about double that to build to begin with (keep in mind, 20 years ago, you got a decent amount of house for 100 thousand, and I’m not counting land costs or anything here) which makes this an especially expensive mistake made at the very beginning of construction.